There’s no shortage of great places to visit on Maui, but here are some of Maui Soap Co.’s favorites. 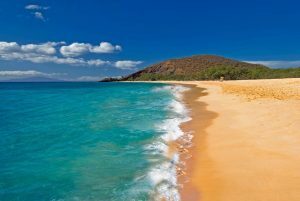 Whether you are a visitor or a Hawaii resident, this list provides a little information about each unique attraction and Maui activity. We urge you to visit Maui and explore all the best it has to offer! Maximize your Hawaiian Island experience and create vacation memories that will be cherished forever. 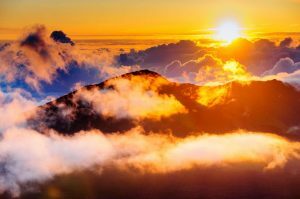 One of Maui’s most memorable experiences is seeing the Haleakala sunrise or sunset from almost 10,000 feet above sea level, and like anything worthwhile, it take some planning. Haleakala is a Hawaiian name that means house of the sun. It is truly an awesome place to watch the clear night sky and stars fade away as the sun lights up the sky and earth. While you’re there you can view the Haleakala crater and you may be able to see the Big Island. The views are OUTSTANDING. One of the longest beaches on Maui. It has over 3,000 feet of perfect white sand where you can just walk and walk along the shore break. A popular beach among tourists and locals with clear aqua water and, usually, calm shore break. Head over to little beach if you’re feeling adventurous. In Hawaiian legend, Molokini was a beautiful woman. She and Pele, the fire goddess, were in love with the same man. The jealous Pele cut her rival in two and transformed her into stone. The woman’s head is supposedly Puʻu Olai, the cinder cone by Makena Beach. 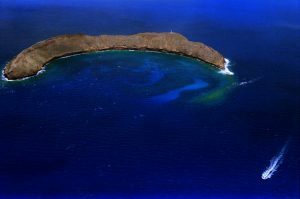 Molokini is a popular tourist destination for scuba diving, snuba, and snorkeling. Its crescent shape protects divers from waves and the channel’s powerful currents. No rain, no rainbows! Rainbows can be found pretty much anywhere and at anytime, you can even find moobows! Simple ingredients for them. Just sun and rain, Hawaii has both, so you should be able to find at least one on your trip. 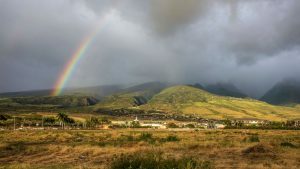 Rainbows love the West Maui mountains, Haiku, Paia, Makawao, Hana, and the south shore. Head out and find some rainbows! Score extra for double rainbows! Remote, wild, low-cliffed volcanic coastline offering solitude and respite from urban life. 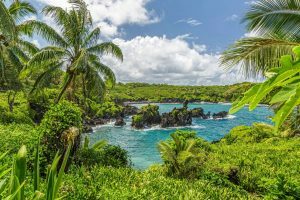 Lodging, camping, picnicking, shore fishing and hardy family hiking along an ancient Hawaiian coastal trail which leads to Hana. Excellent opportunity to view a seabird colony and anchialine pools. Other features include native hala forest, legendary cave, heiau (religious temple), natural stone arch, sea stacks, blow holes and small black sand beach. This entry was posted in Hawaiiana. Bookmark the permalink.